Mr. Santos, shown in 1997, was the Patriots’ radio play-by-play announcer for 36 seasons. The voice of Mel Allen was transporting listeners to the Rose Bowl football game in Southern California on Jan. 2, 1950, and a young Gil Santos was entranced. “What a great way to make a living,’’ he remembered thinking then, a boy growing up in Fairhaven. 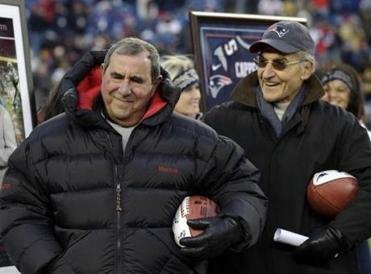 Sixty-three years later, in 2013, Mr. Santos was inducted into the New England Patriots Hall of Fame after 36 seasons and 744 games as the team’s radio play-by-play announcer. Mr. Santos died Thursday, which was his 80th birthday and his 57th wedding anniversary, said his son, Mark. Santos, a legendary broadcaster who died Thursday, called Patriots games for 36 years. Simple, perhaps, but that philosophy, along with countless hours of preparation and a deep, sonorous voice, made Mr. Santos the voice of the Patriots. “For a guy who spoke nothing but Portuguese until he was five, he came a long way,” said his son, Mark Santos. 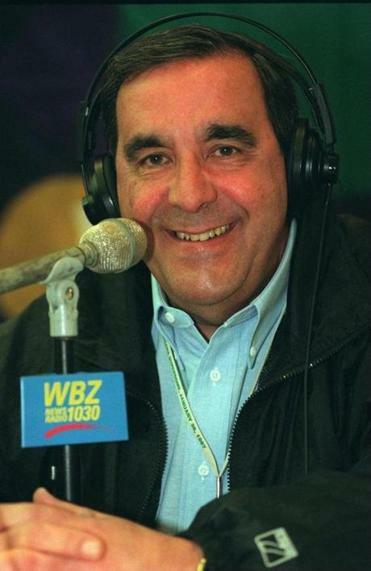 Mr. Santos was also well-known as the radio sports anchor for 38 years for WBZ Morning News. He served as the Celtics play-by-play announcer on Channels 4 and 56 for several seasons in the 1980s. Mark Santos said he spoke with his father Thursday evening to wish him a happy birthday. Santos said the cause of death was not immediately clear to the family. In addition to his son, Mr. Santos leaves his wife, Roberta, a daughter, Kathy, and two grandchildren, according to Mark. Mr. Santos and his color man, Gino Cappelletti, the former star Patriots kicker and receiver, were partners from 1972-78 and then consecutively from 1991 until Cappelletti’s retirement from the booth before the 2012 season. Mr. Santos said he took at least four hours to prepare for every hour on the air, including memorizing names and their pronunciation, and the research and preparation that went into each broadcast was the hardest part of his job. Fittingly born and married on Patriots Day, Mr. Santos enrolled in the New England School of Broadcasting after graduation from Southeastern Massachusetts Technical Institute — now the University of Massachusetts Dartmouth. Mr. Santos, who loved parades, would call cadence and sing marching songs while serving in the Army during the Berlin and Cuban missile crises. He had continued to admire Mel Allen, the voice of the New York Yankees, over the years. Mr. Santos worked on that technique while learning some early lessons in the business at stations WNBH and WBSM in New Bedford. At a high school football game for which he had carefully prepared a spotter’s board with names, numbers, heights, and weights, a steady rain washed away his handiwork. An improbable breakthrough came in early 1966. WBZ radio hired him and although unsure of what his job would be, Mr. Santos soon found out that the station had been contracted to cover Patriots games. He embarked on a job as color commentator with Patriots play-by-play announcer Bob Starr. The highest level of broadcasting Mr. Santos had done to that point was Southeastern Mass. Tech basketball. Just before he got the Patriots job, he was doing four high school football games each weekend. 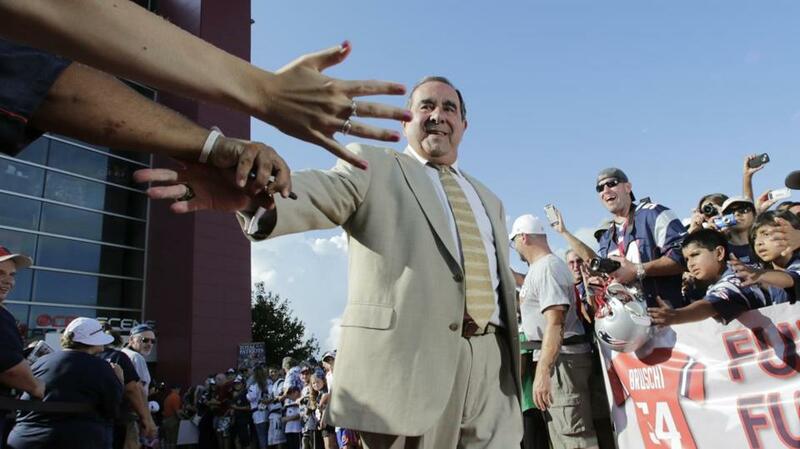 Former New England Patriots broadcaster Gil Santos was congratulated by fans as he walked the red carpet in Foxborough, Mass. He was inducted into the Massachusetts Broadcasters, The Sports Museum, and Fairhaven High School halls of fame and was a recipient of numerous regional and national awards. They included Massachusetts Sportscaster of the Year and a New England Emmy. Mr. Santos also announced Providence College and Big East basketball and Penn State and Boston College football. He was a radio broadcaster at the 1984 Summer Olympics in Los Angeles, continuing to fulfill his boyhood dream of covering sports in sunny California. Like the Patriots players he covered and knew over nearly a half-century, Mr. Santos was a battler. Just days after the team’s loss to the New York Giants at Super Bowl XLVI in 2012, he was hospitalized after being stricken with pneumonia and obstructed pulmonary disease. He was put into a medically induced coma and given the last rites of the Catholic Church. According to the Providence Journal, Mr. Santos could move only his right arm and could not feed himself. But months of rehab and his determination enabled Mr. Santos to come back for his final year behind the mic. His last broadcast was Jan. 20, 2013, at Gillette Stadium, where the Patriots were defeated in the AFC title game by the eventual Super Bowl champion Baltimore Ravens.